Stanford sends six players to compete in The Gifford hosted by UCLA and played at Silverado Resort's North Course in the Napa Valley, which hosted October's PGA TOUR Safeway Open. A unique format combining stroke and match play will be used this year. 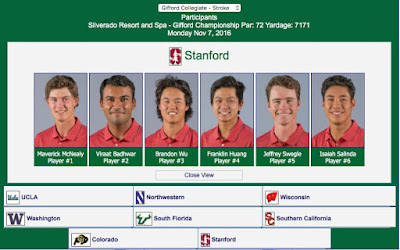 Stanford's team includes Maverick McNealy, Viraat Badhwar, Brandon Wu, Franklin Huang, Jeff Swegle and Isaiah Salinda. The Gifford Collegiate, which in the past had featured 54 holes of stroke play, will be played under a new format this year. The eight-team field will play 36 holes of stroke play on Monday to seed into Tuesday and Wednesday's match play. Tuesday will feature the match play quarterfinals in the morning and the match play semifinals/consolation in the afternoon, followed by the Wednesday championship and consolation bracket matches. Each team will play three match-play contests. 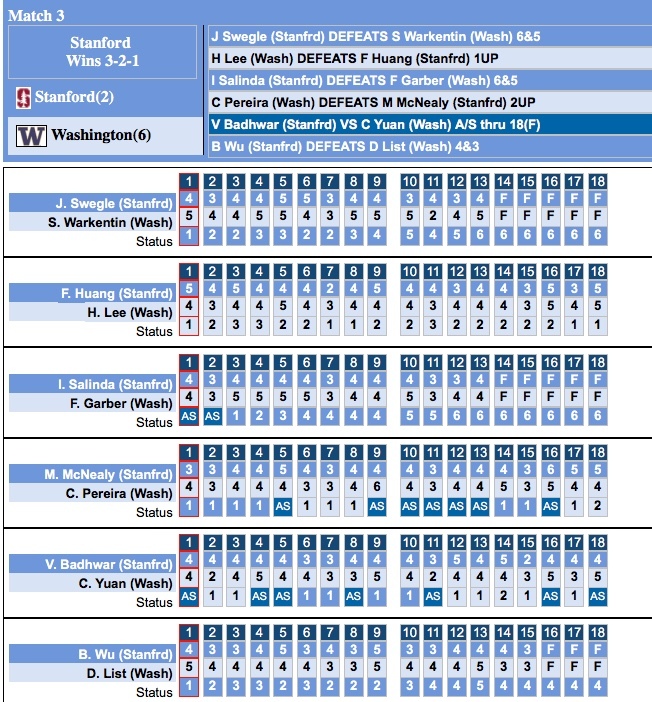 The two rounds of stroke play ended with Stanford finishing 2nd to USC, 17 strokes behind in the 6 team field. 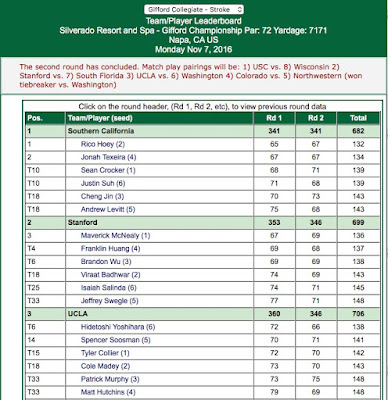 Stanford was led by Maverick McNealy's (67-69 136 3rd) 3rd place result followed by Franklin Huang (69-68 137 T4) tying for 4th, Brandon Wu (69-69 138 T6) tied for 6th, Viraat Badhwar (74-69 143 T18) tying for 18th, Isaiah Salinda (74-71 145 T25) and Jeff Swegle (77-71 148 T33) tying for 33rd. See the top three team and individual scoring results below --- click on image to enlarge. Match 1 - Stanford was paired with the 7th seed South Florida in the first round of match play with the Cardinal winning a close math 3-2-1. 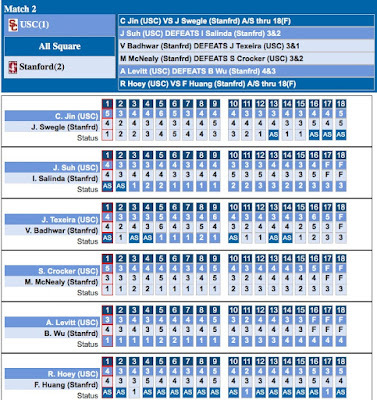 The individual match results are show below - click to enlarge. 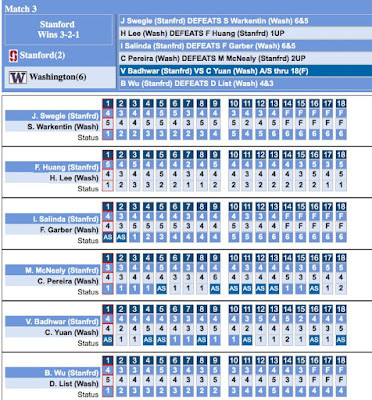 Match 2 - Stanford went up against 6th seeded Washington and won 3-2-1 in the second round of match play. 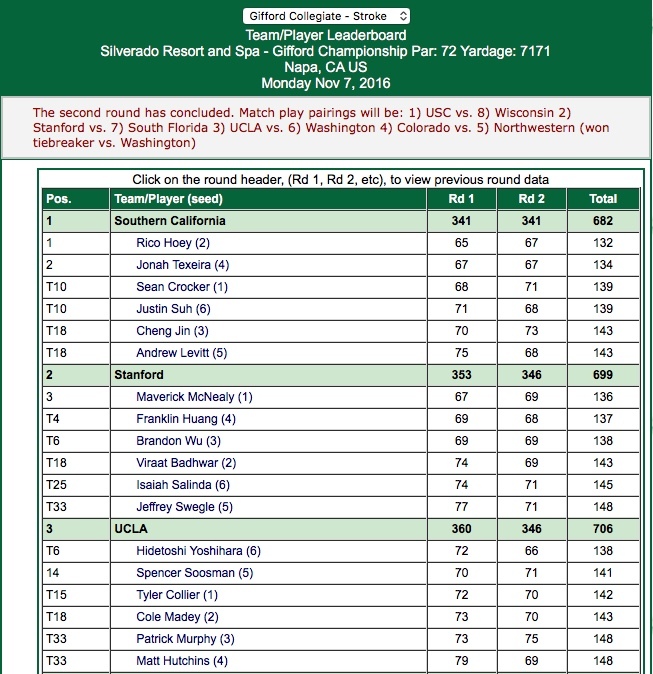 Swegle and Salinda each won 6 & 5, Wu won 4 & 3, Badhwar won his final hole to tie his match and McNealy lost his final 3 holes to lose 1 down. Full results of match 2 are shown below - click to enlarge. Final Match - Stanford and USC battled to a tie in the finals with each team winning 2, tying 2 and losing 2 matches. 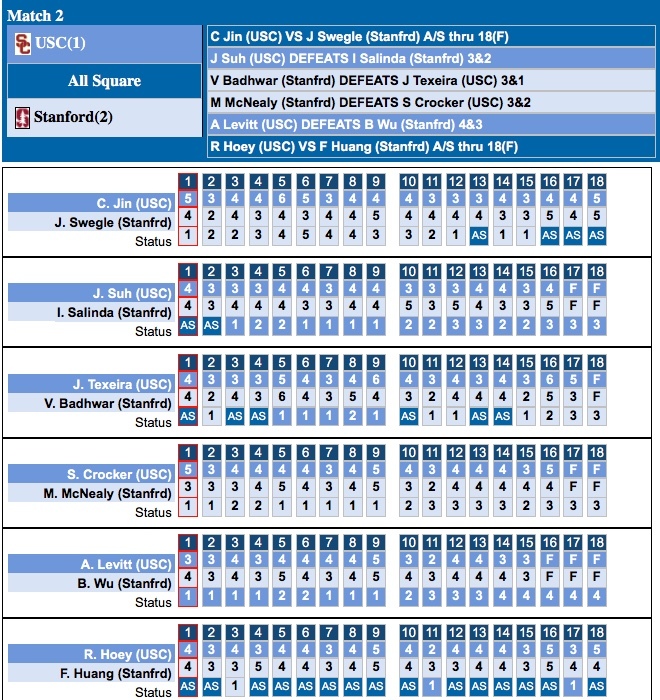 A tie breaker based on the holes won in each match of the finals was won by USC with 7 versus Stanford with 6. Badhwar and McNealy won, Swegle and Huang tied and Salinda and Wu lost. Full results of the finals are shown below - click to enlarge.